First of all, along my sometimes-repetitive travels I once came across the very handy CIS OS hardening and security benchmarks, on which I am basing the majority of this partition scheme. I even talked about it once before, and the Server Fault question I mention there was instrumental in guiding this scheme, too. 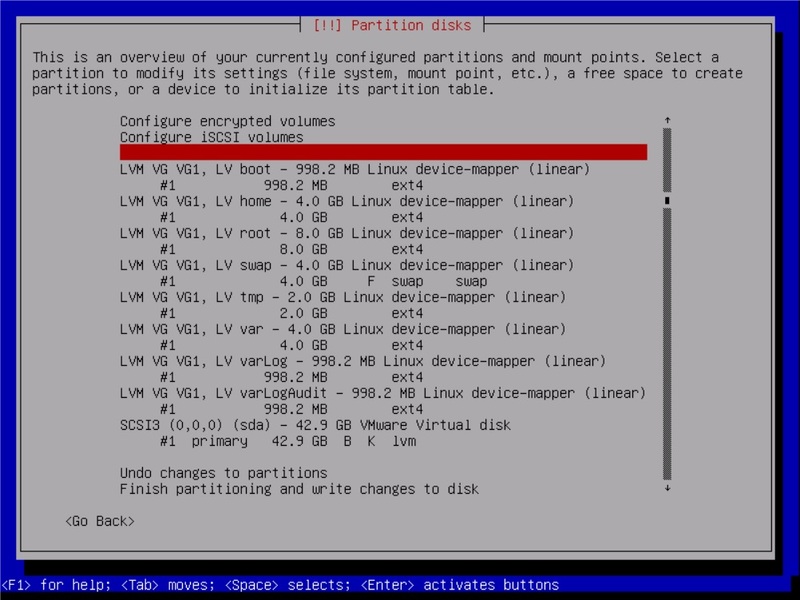 Having set out my partition scheme, I picked my installation options and forged ahead with installation. Admittedly, I don’t fully understand the relationship between /run/shm and /dev/shm – the latter now points to the former but the CIS benchmark only mentions the former so I decided to do both. There’s more about what’s going on between those two, and their relationship in newer versions of Debian, here. I didn’t do anything with the removable device recommendations in the CIS benchmark – being a VM, this machine is unlikely to ever see any removable devices. I’m more likely to just disable the option to mount them to the machine at all and be done with it. I am curious as to whether there’s a way to “dynamically” restrict /all/ future-inserted removable devices in such a fashion, though… I also went ahead with implementing the benchmark’s recommendations for disabling the mounting of their listed file systems, and disabled auto-mounting. Lastly, at this point anyway, we have the Secure Boot Settings. I made the user and group ownership and permissions changes as described in the benchmarks. Next up was the boot loader password – whoo boy… But I’ve already talked about that adventure. And as for anything beyond that? Well, the scope here was just the partition scheme and I’ve already broken that. You have the benchmarks available to you – go check ’em out.